Do you spend a lot of time online? Have you written, commented on, shared and tweeted lots of content on social media? If so, what are you doing to build your personal brand? I know I know. You already have a day job. You are already busting your guts for your company. How can you possibly have any bandwidth to build your personal brand using content? Fortunately, personal brand building isn’t rocket science. Rather, it is about making productive use of your free time to create content that rocks your reputation, polishes your persona, and establishes your expertise. In the social and digital age, people are spending hours each day reading, liking and sharing content, connecting with each other, and following like-minded others. The amount of “influence” which one has over others is often a product of what he or she shares, as well as his or her reputation, likability and expertise. Increasingly, one’s social media footprint also has bearing on one’s real life career success. Potential employers often do a LinkedIn and Facebook search before they hire a new employee. Business partners would suss out one’s LinkedIn profile or company website to determine how worthy you are as a potential collaborator. Likewise, customers would do a search on Google to see what comes out before they buy your products or services – especially if you are a new and untested brand. 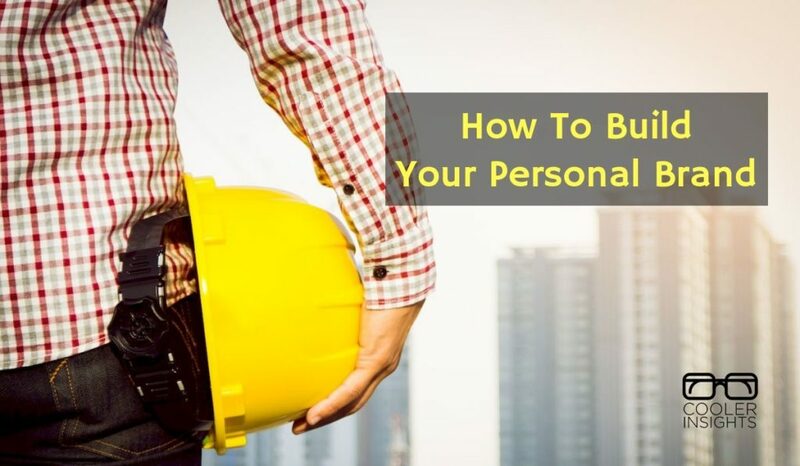 Here are 20 ideas to kick start your personal brand building journey. Invest some time to write persuasive descriptions of who you are, what you do, and why you matter. Do this for each of your social media profiles. Make your write-ups memorable and unique. Customize according to the space provided and the nature of the social platform. Add a nicely shot photo which matches your personal identity. Determine where your unique content marketing niche lies. This requires a mix of soul searching, research, and talking to both family and friends. Ideally, your niche should be a subject that you are passionate about. It should also be an area where you have demonstrated expertise, and which your potential audiences would care about. Choose a platform to write or produce content on. This could be a WordPress website, LinkedIn or Tumblr blog, Instagram account (for those who love photos or visuals) or YouTube (if you’re a natural on screen). Publish regularly. This can be as frequently as daily, or as infrequently as once every 10 days (I don’t recommend anything less frequent than that). Spend some time writing or producing something – anything – every day. This can be as short as a 140 character tweet, as lengthy as a 1,500 word blog post, or as elaborate as a 3 minute video. You don’t have to publish whatever you create daily. Some of my blog posts span days or weeks before they see the light of day. The thing is to be so consistent that you make it a habit – like eating breakfast or brushing your teeth – each and every day. Set your creative muse free. Be expressive. Be unique. Be you. Stretch the boundaries of your imagination. Challenge yourself to explore different ways of sharing your ideas – be it through text, graphic, image, video or audio. Be a storyteller. Nope, I am not telling you to write bestselling teenage fantasy involving a bespectacled boy wizard (although you’ll probably be a billionaire if you did that). Rather, relate the little anecdotes and observations which you have made in life and share them with your networks. Go out and make friends. If content is king, then community is queen. However, don’t just network for the sake of playing the numbers game. Be clear about why you seek to connect with another person. Look out for those whom you have things in common with or whom you can learn from. Humility is a virtue online, especially when we are faced with an avalanche of “gurus” blowing their trumpets. Seek to provide more value than you promise. Give away as much as your knowledge, wisdom and experience as possible. Don’t do so with the expectation of a return – at least not initially. Eventually, people will recognise the value you provide to the world and they will reciprocate. Trust me, I have been there. Beyond serving your own content, you may also wish to find and share content from others. This achieves two objectives. First, your readers and followers would continue to receive valuable information from you, even during those “dry” days. Second, you help to boost the popularity of another person. Do so regularly and others would reciprocate. Your communal goodwill spreads and grows in a magic circle of awesomeness. Focus your content on helping others through education, entertainment or enlightenment. Reduce pain and increase pleasure. There is enough negativity in the world – especially online – and we really don’t need another doom sayer. Be the light that illuminates. Seek to enlighten and educate. Don’t belittle whatever you have gained from your years of education, work and life experience. Every one of us can teach. It can be as broad as global economics and politics to as focused as how to bake that perfect souffle. You can also share insights from your own life encounters. The more you produce content and share them with your networks, the more you learn. Beyond learning from the experts out there through books, blogs, and podcasts, make it a point to also learn from everyday experiences in life. You will be amazed at what you can learn from around you, merely by putting down that mobile device, and being more present. Originality is a vital arsenal in building your personal brand. Be real, speak the truth, and project your unique self. Don’t try to be who you aren’t. While you can certainly learn from the masters in personal brand development, your ultimate goal should be to project who you truly are. If you so wish, indulge in a little bit of weirdness. Wear your idiosyncrasies as a badge of identity. Let your quirks draw your audiences to you – warts and all. As you journey through your path to building your personal brand, seek mentors who can guide and steer you along your own path. Mentors needn’t be a former CEO or a leading life coach (although they would certainly be good ones). They may also be anybody who has been along a similar path, enjoyed some level of success, and is able to help you avoid the pitfalls of your own journey. As humans, we have all committed our fair share of mistakes. Screwing up is part and parcel of our lives. Don’t be afraid to say sorry when you need to. There is absolutely nothing wrong with that. In fact, showing your vulnerable human side would endear you to more people. Keep your ears open and eyes peeled. Monitor responses to your posts, measure what works (and what doesn’t), and calibrate your content. Now this doesn’t mean just writing what your audience tells you to. You need to balance between what you wish to say and what your audience wishes to hear. Ultimately, the decision is yours to take. Any form of regular content creation and sharing requires stamina and determination. You need to will yourself to keep at it, come hell or high water. Make it a part and parcel of your daily routine. If necessary, make an appointment with yourself. It doesn’t matter if what you produce on certain days reads like rubbish. You can always refine and improve them later. The point is to stick to doing it. Every now and then, take a sabbatical. Personal brand building through content is not for the weak hearted. After some time, it does wear you down. Go offline for a day. Read a good book or a thought provoking movie. Visit a new neighbourhood. Take a long walk. Should time and finances permit, you may even wish to go on a short break. Use the opportunity to reflect and rejuvenate yourself. Finally, take the time to build friendships and deepen relationships with those around you. For your most ardent supporters and followers, consider bringing the relationship offline so that you can meet them face-to-face. Continue the sharing and conversations face-to-face.